#1 – Each person sends an average of 55 greetings cards per year. #2 – The average American household spends about $64 on holiday cards and gift wrap each year. #3 – The average American receives eight birthday cards and four gifts a year. #4 – Valentine’s Day is the 2nd largest holiday for giving greeting cards. …This does not include packaged kids’ Valentines for classroom exchanges. According to Hallmark, more people are born in August than any other month (9.07%). About 21 million Americans have birthdays in August. And, in recent years, July ranks number two in birthdays (8.80% of births) and February is last (7.55%). According to Hallmark, more than half of the U.S. population celebrates Valentine’s Day by purchasing a greeting card. The top recipients of Valentines are husband, wife, son, daughter, grandchild, friends and parents. Women receive half of all Valentines. 50% of all Valentine cards are purchased in the 6 days prior to Valentine’s Day. Hallmark’s share of the U.S. greeting card market is greater than 50%. Worldwide, Hallmark has more than 18,000 full-time employees. About 4,500 Hallmarkers work at the Kansas City headquarters and about 9,900 are associated full-time with the U.S. personal expression business. Hallmark’s creative staff consists of around 800 artists, designers, stylists, writers, editors, and photographers. Together they generate more than 19,000 new and redesigned greeting cards and related products per year. The company offers more than 48,000 products in its model line at any one time. 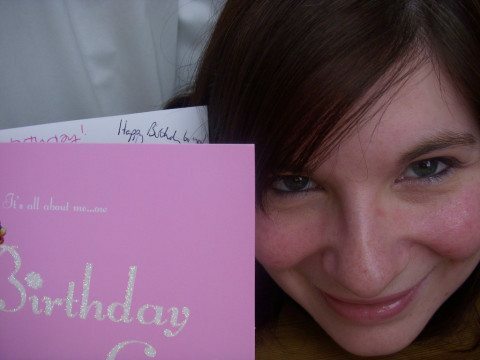 They say that people write additional messages inside a birthday card 70% of the time. I think that’s my whole hang-up with greeting cards… I take far longer to compose my lines for the inside of a Hallmark card than most people do. Sometimes, it can take me days or even weeks to write exactly what I want to say. Such is probably why I refrain from signing & sending too many cards these days. It must be the “proofreader” in me… I keep re-reading what I wrote and changing words here & there, until I get it ‘just right’. Often, by the time I’ve gotten it ‘just right’, that special day has passed. That’s also why I love online e-cards! They’re quick & easy and say most everything for you! However, about two-thirds of birthday cards are still mailed these days. Here are some great ideas for jazzing up your words inside the greeting cards you send! 10 creative uses for old Christmas cards. Make your own brown paper business card holder. Personalized postage stamps and unique holiday greeting cards.